With reference to the report, “Beware! Missed call clones SIMs!” (July 2), upon cross-checking with more sources, TOI learns that cloning a SIM card requires physical access to it or the interception of the communication between the caller and his or her cellphone operator’s network. Wirelessly or remotely intercepting information contained within the SIM, though theoretically possible, is considered extremely difficult. It may require hacking into the telecom operator’s network or using very expensive tools. General manager, BSNL Moradabad, RV Verma, said research is under way to detect how cloning of SIM card or a cell phone was possible by way of drop-ping missed calls or getting the target dial a particular number. “We are working on it and hope to decipher how it is happening,” Verma said. About the origin of the alert, Verma said it was an official BSNL communication to him. “The alert was circulated to quite a few other circles,” he told TOI. There would have been times when you would have received a missed call from numbers starting with +92 or even #90 or #09 but if you have not then, you are lucky. It has been noted by various telecom operator and intelligence agencies that many subscribers who have been receiving missed calls from numbers starting with ‘+92’ have fallen prey to getting their phone and SIM cards, cloned. The numbers could be much higher than expected as many people who tend to receive missed calls, mostly call back to find out who form the other end had called them up. A woman, who is a victim of such a case reported a similar incident to the BSNL officials in Moradabad and said that she lost loads of balance, said that in case the user takes the call before it is dropped, the person on the other end poses as a Customer Care Executive who intends to check for network connectivity and call flow. With this the person asks subscriber to press #09 or #90 call back on his number to establish that the connectivity to the subscriber was seamless. After all of this, she found out that she lost her balance at a very fast rate and whenever she used to go in for a recharge, her balance again reduced to single digit figure within minutes. It is advised to mobile users to firstly never attend calls from number starting with ‘+92’ or even call back when they get a missed call. Also, it is advised that users do not save any personal and confidential details like back account numbers and passwords on their mobiles. As in-case their device is cloned by hackers, and then the hackers can use all your details and misuse it. 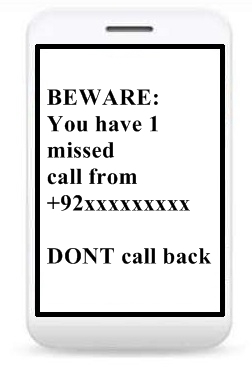 So, for now Be-Aware and Beware of any such missed calls and never call back. Also if you have got any such missed calls, or been a victim of this, please share your experience with us in the comments section below.